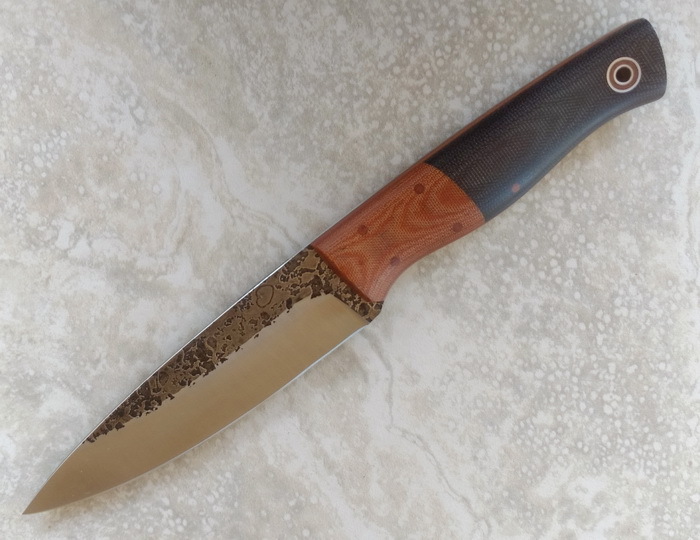 **** Chosen by Winner: David K.
Fiddleback Forge was started by Andy Roy in his garage in 2007. What began as a passion project quickly graduated to a real business in May of 2009 when Andy was laid off from his job as an antenna engineer. With his new basement shop, he began turning out 6 knives per week and was able to make ends meet. More than a decade after Andy’s first knife was made from a file and some leftover hickory was made in his garage, Fiddleback Forge is housed in a professional shop with several full-time employees & apprentices. The current operation has successfully created thousands of beautiful handmade knives. In addition to the beloved handmade models, there’s been countless Mid-Tech Production Field Knives made. Handles and grinds are the focus of my knives. I am a tool-maker at heart, and strive to make a real cutting tool that is comfortable to use. The grind I like to put on knives (I still do all the bevel grinding) is the convex grind. I fell in love with convexed knives from the Himalayan Imports Khukuri. I like the strength of the convex grind on a knife, and I find them the easiest to maintain. This is especially true in the field, certainly sandpaper is easier to carry, and less likely to break than stones. The other aspect of my knives that make them special is the handle. I shape each handle with grinders and files, making each handle comfortable to use and naturally indexed in the hand. I always liked carving walking sticks, back in the Boy Scouts, and I think the shaping still appeals to me on that level. For a long time, the comfort of the handles was the highlight of the knives, while I worked out exactly how to make the convex grind look good. Every day, I strive to make the handles more comfortable, and the grinds cleaner with every batch. Hopefully, every knife we finish this week is the best knife we’ve ever made.